I have searched for profitable companies that pay rich dividends and that have a very low PEG ratio. I also looked for companies that are in short-term uptrend, in mid-term uptrend and in long-term uptrend. Stocks in an uptrend are performing well and are in a buying mode. 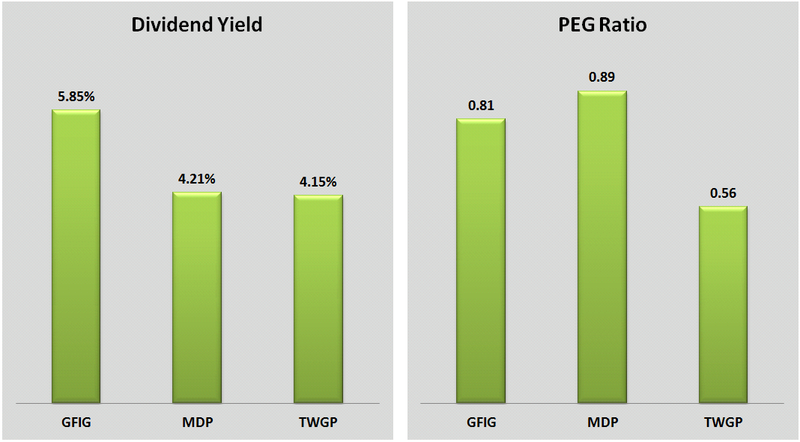 2. Dividend yield is greater than 4.1%. 3. The PEG ratio is less than 0.90. 4. Forward P/E is less than 15. 5. Average annual earnings growth estimates for the next five years is greater or equal 14%. 6. Stock price is above 20-day simple moving average (short-term uptrend). 7. Stock price is above 50-day simple moving average (mid-term uptrend). 8. Stock price is above 200-day simple moving average (long-term uptrend). GFI Group Inc. provides wholesale brokerage, clearing, and electronic execution and trading support products and services for financial markets in the United States, the United Kingdom, and internationally. 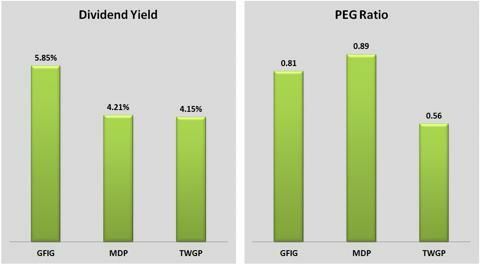 GFI Group has quite a low debt (total debt to equity is 0.59) and it has a very low forward P/E of 10.06; the PEG ratio is also very low at 0.81. The average annual earnings growth estimates for the next five years is very high at 20%, and the price-to sales ratio is very low at 0.44. The forward annual dividend yield is very high at 5.85%. The GFIG stock price is 0.60% above its 20-day simple moving average, 0.33% above its 50-day simple moving average and 10.57% above its 200-day simple moving average. That indicates a short-term, mid-term and long-term uptrend. GFIG will report its latest quarterly financial results on April 22. GFIG is expected to post a profit of $0.06 a share, a 14.3% decline from the company's actual earnings for the same quarter a year ago. The reported results will probably affect the stock price in the short term. 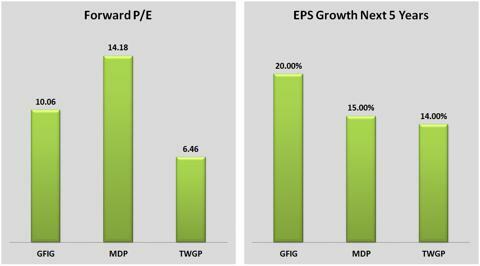 The cheap valuation metrics, the very good earnings growth prospect, the very rich dividend, the fact that the stock is trading way below book value (price-to-book value is only 0.94) and the fact that the stock is in an uptrend are all factors that make GFIG stock quite attractive. Meredith Corporation, a media and marketing company, engages in magazine publishing and related brand licensing, television broadcasting, digital and customer relationship marketing, digital and mobile media, and video creation operations in the United States. Meredith Corporation has a low debt (total debt to equity is only 0.45) and it has a trailing P/E of 15.61 and a low forward P/E of 14.18; the PEG ratio is very low at 0.89. The average annual earnings growth estimates for the next five years is very high at 15%, and the price-to sales ratio is very low at 0.97 . The forward annual dividend yield is quite high at 4.21%, and the payout ratio is at 60%. 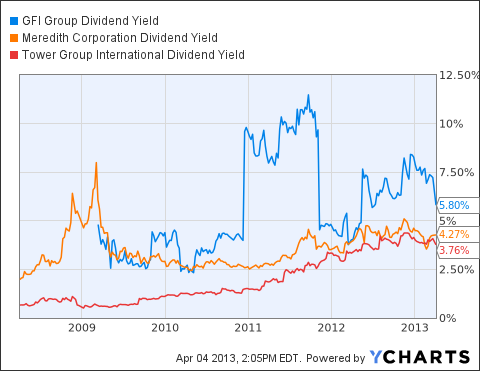 The annual rate of dividend growth over the past five years was quite high at 15.2%. The MDP stock price is 3.08% above its 20-day simple moving average, 1.83% above its 50-day simple moving average and 14.22% above its 200-day simple moving average. That indicates a short-term, mid-term and long-term uptrend. Meredith Corporation will report its latest quarterly financial results on April 22. MDP is expected to post a profit of $0.68 a share, a 3% rise from the company's actual earnings for the same quarter a year ago. The reported results will probably affect the stock price in the short term. All these factors -- the very low multiples, the rich dividend and the fact that the stock is in an uptrend -- make MDP stock quite attractive. Tower Group International, Ltd. through its subsidiaries offers commercial, personal and specialty insurance and reinsurance products. Tower Group International has a low debt (total debt to equity is only 0.46) and it has a very low forward P/E of 6.46; the PEG ratio is also very low at 0.56. The average annual earnings growth estimates for the next five years is very high at 14%, and the price-to sales ratio is very low at 0.54 . The forward annual dividend yield is quite high at 4.15%. 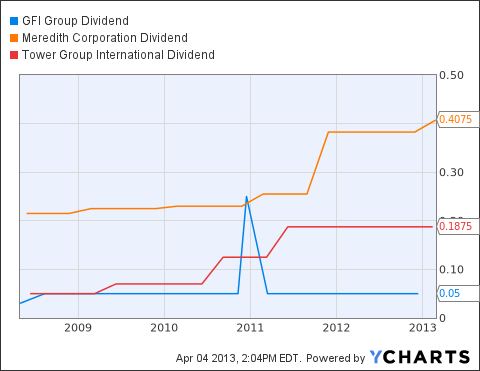 The annual rate of dividend growth over the past five years was very high at 38%. The TWGP stock price is 1.89% above its 20-day simple moving average, 4.56% above its 50-day simple moving average and 9.30% above its 200-day simple moving average. That indicates a short-term, mid-term and long-term uptrend. Tower Group International will report its latest quarterly financial results on May 6. TWGP is expected to post a profit of $0.56 a share, a 14.3% rise from the company's actual earnings for the same quarter a year ago. The reported results will probably affect the stock price in the short term. 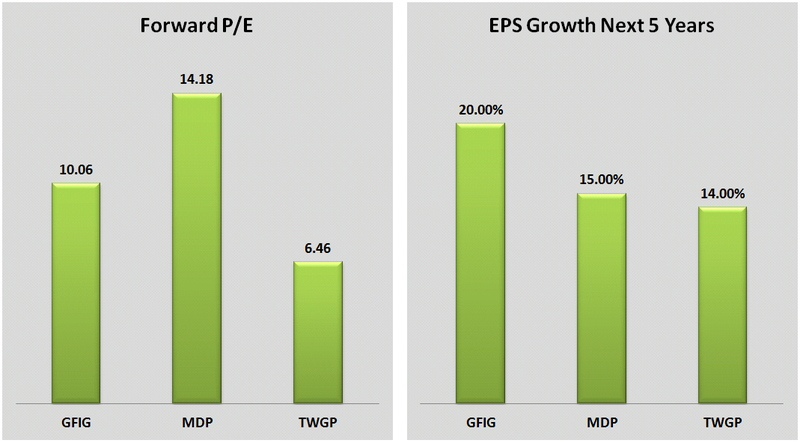 The cheap valuation metrics, the good earnings growth prospect, the rich dividend, the fact that the stock is trading way below book value (price-to-book value is only 0.80) and the fact that the stock is in an uptrend are all factors that make TWGP stock quite attractive.